Synthetic insecticides, natural oils and homemade sprays can be toxic to your garden! Chemical and natural pest control applications upset the natural balance of “good” and “bad”. Before you crush up a jalapeno to make your own (Do-It-Yourself) DIY repellent…before you douse your plants with neem oil…before you reach for a can of chemical death…please rea d this electronic book. You’ll be convinced that hot pepper belongs in salsa and not in a spray bottle. Insects are fascinating – even the ones that wreak havoc on our tomatoes, okra, sweet corn and kale. Find out what makes our worst garden enemies so special. Take a break from technical bug guides and have fun observing what lives in your soil, breeds on the backsides of leaves and secretly preys upon the most destructive garden pests. Learn the best natural defense techniques for keeping pests at bay without chemicals or even homemade pepper sprays. There’s a growing desire for unaltered fresh vegetables and fruit. There’s a growing desire for unaltered fresh vegetables and fruit. Some of us are passionately opposed to Genetically Modified Organisms (GMO’s). We also now question the integrity of organic foods. Along with our growing concern for food safety is a growing desire to eat the cleanest produce possible, void of foreign residue and chemicals. And if we grow our own food, we need to know the least toxic way to control pests. How pollinators and natural predators help keep pests away and what you can do to stay out of their business. Beautiful beneficial insects you should protect and how to do it. How to hunt tomato hornworms at night, trap whiteflies and easily weaken an army of aphids. The difference between many insect “look-alikes”. You won’t damage the friendlies ever again! 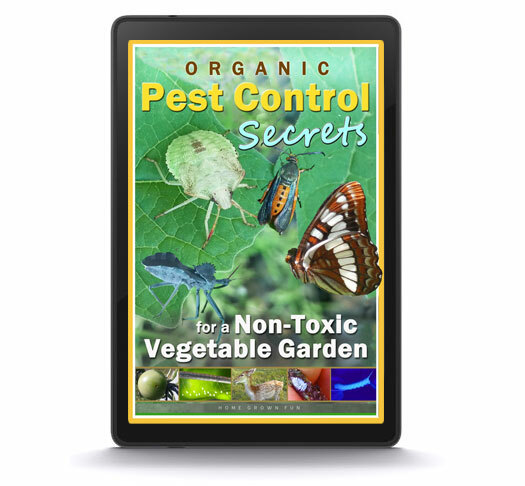 How pests find the garden in the first place plus simple ways to throw them off. How much damage pests actually cause. Don’t waste your precious time on pests that don’t matter. The difference between pool grade and food grade diatomaceous earth and why it is so important for you to understand. The most effective companion plants to deter aphids. What happens in your garden when you over fertilize with nitrogen and use “miracle” soil products. The difference between “kissing bugs” that can cause Chagas Disease and other assassin bugs that are beneficial to your garden. Flowers, herbs, fruit and vegetables that attract bees. The difference between moths and butterflies and the best plants for attracting butterflies. Big mistakes people make when planting milkweed for monarchs and how to easily avoid them. The lifecycle and migration of monarch butterflies in images and drawings. Herbs that deer probably won’t eat and methods for keeping them out for good. Natural grasshopper predators and fund ways to eat gourmet grasshoppers! How to select squash varieties that are less likely to be attacked by pests. How to raise a sphinx moth from a tomato hornworm. The most popular snail control methods and their pros and cons. 1) At Amazon in eReader format or 2) Here on this website as an INSTANT .pdf download.